What an Amazing Way to Do Life! Sign up to an invaluable self help video series now! How about a life changing seminar? 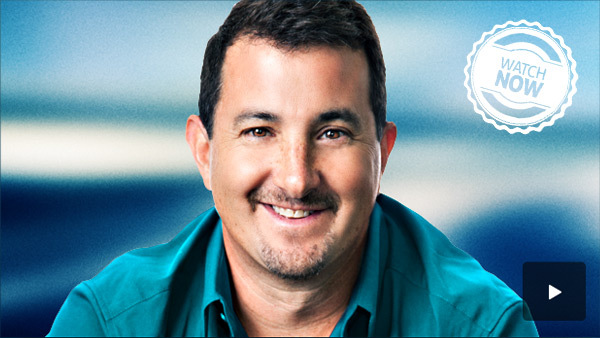 Check out Dr. Brett's Magic Life, Magic Golf Seminar! Check out Dr. Brett's blog now! Dr. Brett combines a keen understanding of human nature, with a practical sense for how professional organizations operate. The result is valuable insight into how to maximize career-building potential. Relocating to a new place and growing a business at the same time can be challenging and overwhelming, especially in an economic downturn. 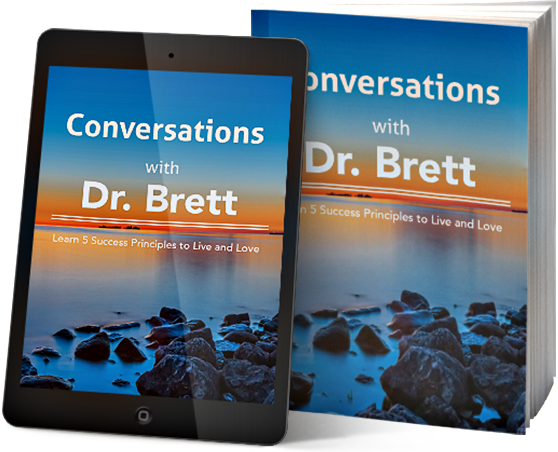 "Conversations with Dr. Brett" for only 5.99$! Regardless of the sport, athletes can improve their performance significantly by learning to focus and concentrate better and improve their self-confidence. Change your negative habits, self-sabotages, limiting beliefs, and poor communication. Become substantially more confident, capable, creative, purposeful, and self-sufficient! Overcome the blocks and obstacles to greater success in both your personal life and career. Learn the fundamentals of a successful life including presence and purpose. What Dr. Brett offers on this site! Dr. Brett offers his knowledge and expertise in a series of one to two minute videos that are available to the public now! Sign up now for Dr. Brett's Help Video Series to change the parts of your life that are stagnant, frustrating or downright depresssing. Create the life you deserve, the one you know is possible if only you had the right guidance and perspective! Enjoy Dr. Brett's video commercials; media that you will find at times comical, inspiring and informative! To more fully experience Dr. Brett, actively follow his blog to enjoy an insiders view on his philosophy, style and perspective! As a life coach, Dr. Brett brings tremendous passion to his work guiding individuals and small groups to live with much greater courage and creativity and to communicate in ways that light others up! Over time, his clients learn the fundamentals of living a healthy, successful life. For example: to avoid nothing, be as present as possible, have bang-up integrity, honor yourself, and develop and trust your intuition. The more we practice living the right way and the more we move away from self-sabotage and other self-defeating habits, the greater our passion and confidence, inevitably leading to success! As a business consultant, Dr. Brett brings his knowledge and experience of psychology and mindfulness to the business world uniquely assisting businesses and organizations pursue their goals with greater teamwork and intense focus. Having assisted top executives and a multitude of entrepreneurs, Dr. Brett is flexible in his approach helping leaders and managers communicate at such high levels that their organizations thrive over time. An avid networker and generous by nature, Dr. Brett uses his own experience to help businesses build relationships that are as solid as bank vaults. And with his strategic mind, he loves to help organizations find creative solutions to age-old challenges like how to grow and who to hire. With passion and purpose, Dr. Brett, Sports Psychologist, avid golfer and good athlete, assists a wide range of both competitive and non-competitive athletes such as golfers, soccer, football, and baseball players to perform at much higher levels and to achieve their dreams and goals. His commitment to excellence and expertise with the mental game has a huge impact on their success over time. Teaching athletes to systematically focus on the Fairway, a metaphor for what you want in life, business, and sports and to systematically eliminate the dramas and distractions is essential. His work with athletes also involves a great deal of teaching on meditation and mindfulness, the basis for present moment awareness, the magic of success. A licensed psychologist since 1997, for nearly two decades Dr. Brett has helped countless individuals, couples, and families address a wide range of issues and dynamics from anger and poor self-esteem to anxiety, depression, and addiction. His fluid and dynamic style motivates clients to move through fear, inertia, self-sabotage, and other barriers to success and intimacy. Over time, his clients unleash their true potential and live more passionately and fully. 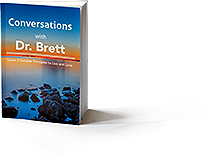 In Conversations with Dr. Brett, who is a prominent life coach and sports psychologist, teaches a young woman named Katie much of what he has learned in over 30,000 hours of working with people and living adventurously. Relocating to a new place and growing a business at the same time can be challenging and overwhelming, especially in an economic downturn. Seeking advice from Dr. Brett saved me time and money. Solution oriented, he has helped me focus my consulting practice to run more ... Corinne T.
Dr. Brett combines a keen understanding of human nature, with a practical sense for how professional organizations operate. The result is valuable insight into how to maximize career-building potential. Michael C.
Dr. Brett worked with me intensively and helped me build the skill sets and discipline it takes to win in life. RD R.
Dr. Brett has a unique approach to life that has inspired me to live life more abundantly. The freedom Brett has created in his own life is a testimony in and of itself. The possibilities are infinite. JM R.
Dr. Brett is a total package…he has helped me to clarify and redefine both my life and my business. Malene B.
Dr. Brett has combined business coaching and psychology in helping me understand and get rid of distractions that interfered with my business. His approach has also helped me in all facets of life. He is laser sharp when it comes to producing results now. Bob T.
Dr Brett is truly an inspiration to work with. His sessions are compassionate and true. He is an amazing life coach because he brings integrity and intuition that catalysts true positive changes. I have worked with Brett for a long time and I can honestly say that he has helped ... Emily H.
For the past several years, I have been working with Dr. Brett on creating a life that is both fulfilling and exciting. In this regard, his guidance has been invaluable. Brett has inspired me to take actions that have lifted me to new levels and moved me into directions I never ... Sean M.
Finding it difficult to stay in touch while on the go, here Dr. Brett has made it easy for you. Now you are able to keep in contact and get quick bites daily and responsively from a wide range of well-known internet websites; Twitter, Pinterest, Facebook, YouTube and his personal blog. You will discover new perspectives on a wide range of important topics such as communication, intimacy, success, achievement, creativity and so much more! Now and always, from any device, stay in touch with Dr. Brett and his life altering methods instantaneously.